This category contains 13 articles I believe are from 1905. There is a biographical profile and several references to his famous Green Dragon race car. Two more articles reference Barney Oldfield’s long time manager, Ernie Moross. Moross later became the director of contests at the Indianapolis Motor Speedway in 1909. For a view to Barney Oldfield's personal life, this article reports on his marriage to Mrs. Bess Holland. He met her in the St. Louis hospital he stayed in briefly to recuperate from injuries suffered in the Louisiana Purchase Trophy from August 1904. This is a combination of two articles that paint a pretty good picture of Barney Oldfield's race team operation. His attire is described in detail: a new suit, black derby and even a large diamond ring. His relationship with Ernie Moross, Will Pickens and team driver Charles Burman are highlighted as well. This is an interesting article that is essentially an interview. The newness of the sport is keenly on display as Oldfield handles questions about how difficult it is to breath riding on a car traveling a mile a minute. It appears this article was published in February 1905. Oldfield granted an interview with the Dallas Times-Herald shortly after arriving in town from New Orleans. Inevitably, questions turn to the dangers of auto racing and Oldfield describes how best to react when a drivers knows he will crash through a fence. This is an editorial cartoon that comes across as a personal attack on Barney Oldfield. Inspired by his 1904 accident at St. Louis in the Louisiana Purchase Trophy race where the Peerless Green Dragon crashed through a fence to kill two spectators. While it is understandable that some people saw auto racing as unnecessarily dangerous, laying the full responsibility for that at Oldfield's feet reflects ignorance. 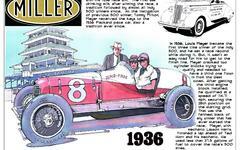 This is one of those great articles that provides color to the early days of auto racing and barnstorming tours. This piece describes an Oldfield stop in Reno, Nevada. Cowboys there circled the car because a local promoter had spread rumors about how many men it had killed. They came to see the notches on the Peerless Green Dragon. Not finding any, they warned Oldfield that if he wanted anyone to take him and his program seriously, he had better file a notch for each man the machine had consumed. This is a strong collection of articles that capture the attitude and persona of Barney Oldfield early in his career. One article discusses his marriage to Bess Gooby Holland. Another article is written by a newspaperman who dared to ride with Oldfield on the Peerless Green Dragon. The final article is a rare treasure that catches up with Oldfield's long time rival, Earl Kiser, who was injured in August 1905 at the Glenville track in Cleveland Ohio. These two articles are examples of local coverage newspapers played to citizens when Barney Oldfield's barnstorming troop came to town. The headline, "Man Smashing Devil Machine" refers to Oldfield's Peerless Green Dragon. In this case, the Oldfield team was playing their show before the citizens of Topeka, Kansas. This is a Motor Age article covers a February 1905 race meet in New Orleans. Heavy rain produced a muddy track and a driver Oldfield was supposed to run with in an exhibition refused to run in the mud. Oldfield, ever concerned about playing to the crowd - and never wanting to give them a reason to demand their money back - asked one of his mechanics to run. The mechanic, Albert Bechold, lost control and somersaulted the car. Fortunately, he was thrown clear into the soft mud and not injured. This is an interesting article that provides insights to how Oldfield's barnstorming tour worked. His manager, Ernie Moross (who later became the director of contests at the Indianapolis Motor Speedway when it was founded in 1909), was in Dallas to make arrangements for Oldfield and the team when they arrived from New Orleans.